Gather those pretty lil &quot;bits &amp; pieces&quot; it&#39;s SWAP time! Gather those pretty lil "bits & pieces" it's SWAP time! OK, now lets make it official and sign everyone up for a fabulous swap! I know, I'm a few days late but life has a way of messing up your schedule. We're calling this the "Bits and Pieces Collage Swap", and I think we'll get some outstanding results because it's so open to your own interpretations yet it's all mapped out so it'll be pretty fool proof. We start with a 9" x 12" canvas, either raised and stretched or panel style...it's your choice . Then divide the canvas into a grid of 12, three inch squares. That is your field of play...after that the idea is to use any bits and pieces of pretty little things, ie...ribbon, papers, photos, labels, trinkets, buttons, fabric, ric rac, lace, cupcake toppers, matchsticks, toothpicks... whatever! Use paint maybe for the base color of your canvas... Go with a tight color palette or use every color you got! Here's one thing, I'm going to try to make good matches as far as swap partners go. So if you want in on the swap email me with all your info: name, mailing address, blog link if you have one, fave colors, preferences, likes, (example: you like polka dots, mint green, glittery stuff, rhinestones, black and white photos, pale pink and millinery flowers). Then once you get matched up with a partner they will have this info and can create something with just you in mind and vice versa. Today is Wednesday the 6th and I'll keep sign ups open until midnight (California time) Saturday the 9th. Then I'll get you all paired up and we'll have exactly two weeks from Monday the 10th to ship out our Bits and Pieces collages. So ship out day will be Monday the 25th. If you've got a vacation squeezed in there somewhere or lots of busy family get together type stuff...just email your partner and let them know of any delays. I've been getting messages from some cheerful crafters and creators who are oh so excited to put theirown bits and pieces to use. That's what's great about this project...the individual 3" x 3" squares are the perfect size for all those left over scraps you accumulate on your work table. 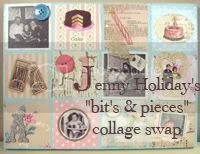 A couple of posts ago I showed some pics of my bits and pieces collage and I can't wait to do more. I have to give credit to Charlotte for inspiring the project in the first place with her creations made from left overs. And then the quick as a whip Heather, after seeing my post, went craft crazy and sent me pics of her bits and pieces artwork. I think this is a swap that'll have some residual effects and long after it's over we'll all still be working within a similar format. This week is topsy turvy...first off, our car died. Gone. Over. Huge inconvenience and as starving artists the financial end of it is a horror, but the show must go on. We have terrible luck with cars and we'll tell the stories to the younguns when we're ninety. For now we'll try to keep the spirits bright. My sister went off to Cali for a week to attend a friends wedding and drive up the coast. My little bro Jay is flying out on the weekend to meet her. They'll have a bonding blast! Anyway, we're babysitting her tiniest of dogs Jack. He's a Papillon and is a sweetheart, but oh boy, him and our little Carlos turn into whirling Dervishes all over the apartment. Anyway, The SisBoom event is this weekend! And with the dead car situation we thought we were not going. For the past two days we've been silently devastated that we wouldn't be able to make it up to Wilton to see the near, dear and legendary Jennifer Paganelli. But we found out this evening that my dad's van will be available for us...so...we're back in business for Sis Boom. If anybody is in the tri state area I totally recommend the trip up to Jennifer's. She makes her home into the brightest, cheeriest, sparkliest, boutique you ever saw! She does it twice a year...now and in the Fall. And she takes credit cards! It's just funny to see the swipe machine on her kitchen table. So go if you can and if you can't I'll post pics of the day. Though I never snap enough...and once drove a few miles toward home and told Aar to turn back around because we had to go back and take some photos! So, check out her site for all the details. OH YEAH! Sign me up, Jenny. Count me in! I will email you with my details. Thanks for doing this, so glad I didn't miss this one!! 'morning jenny! Gosh, I followed your link over to Charlottes and almost forgot to come back! Another lovely site I must visit routinely now. Great swap idea...I'm in! Yeah! What a fantastic swap!! I can't wait to create! Hi Jenny! I would love to join in the swap!!! It looks like so much fun!!!! What a GREAT idea! You have such beautiful things and I love the board that you did...so sweet! I just came back from Jennifer's Sis Boom event. I wish I knew you were going - I would have timed it to be the same time so I could have met you! Hi Jenny, please sign me up for this swap, looks like tons of fun. I love pastel, ice cream colors, vintage sewing, gardening, thrifting and yard sales. I love rusty junk in my garden. I started visiting your site after I learned about it when I signed up for Silver Bella. I hope to be taking one of your classes there. I would love to participate in your swap. This will be my first time doing a swap. I am very excited. I love pastel, ice cream colors; vintage wallpaper; all things glittery and pink; unique small trinkets found many times at flea markets; vintage embellishments such as buttons and ribbons; and again all things PINK! As of right now I do not have a blog, but would love to fit that in sometime in the not so distant future. i would love to join this wonderful swap!! sign me up!! I think I've already joined the swap on another of your postings, but just in case~~~ Count me in! This will be a fun challenge for me!